The Viking Age (793–1066 AD) is a period in European history, especially Northern European and Scandinavian history, following the Germanic Iron Age. It is the period of history when Scandinavian Norsemen explored Europe by its seas and rivers for trade, raids, colonization, and conquest. In this period, the Norsemen settled in Norse Greenland, Newfoundland, and present-day Faroe Islands, Iceland, Norway, Sweden, Normandy, Scotland, England, Wales, Ireland, Isle of Man, the Netherlands, Germany, Ukraine, Russia, Turkey and Italy. Viking travellers and colonists were seen at many points in history as brutal raiders. Many historical documents suggest that their invasion of other countries was retaliation in response to the encroachment upon tribal lands by Christian missionaries, and perhaps by the Saxon Wars prosecuted by Charlemagne and his kin to the south, or were motivated by overpopulation, trade inequities, and the lack of viable farmland in their homeland. Information about the Viking Age is drawn largely from what was written about the Vikings by their enemies, and primary sources of archaeology, supplemented with secondary sources such as the Icelandic Sagas. In England, the beginning of the Viking Age is dated to 8 June 793, when Vikings destroyed the abbey on Lindisfarne, a centre of learning on an island off the northeast coast of England in Northumberland. Monks were killed in the abbey, thrown into the sea to drown, or carried away as slaves along with the church treasures, giving rise to the traditional (but unattested) prayer—A furore Normannorum libera nos, Domine, "Free us from the fury of the Northmen, Lord." Three Viking ships had beached in Weymouth Bay four years earlier (although due to a scribal error the Anglo-Saxon Chronicle dates this event to 787 rather than 789), but that incursion may have been a trading expedition that went wrong rather than a piratical raid. Lindisfarne was different. The Viking devastation of Northumbria's Holy Island was reported by the Northumbrian scholar Alcuin of York, who wrote: "Never before in Britain has such a terror appeared". Vikings were portrayed as wholly violent and bloodthirsty by their enemies. In medieval English chronicles, they are described as "wolves among sheep". The first challenges to the many anti-Viking images in Britain emerged in the 17th century. Pioneering scholarly works on the Viking Age reached a small readership in Britain. Linguistics traced the Viking Age origins of rural idioms and proverbs. New dictionaries of the Old Norse language enabled more Victorians to read the Icelandic Sagas. In Scandinavia, the 17th-century Danish scholars Thomas Bartholin and Ole Worm and Swedish scholar Olaus Rudbeck were the first to use runic inscriptions and Icelandic Sagas as primary historical sources. During the Enlightenment and Nordic Renaissance, historians such as the Icelandic-Norwegian Thormodus Torfæus, Danish-Norwegian Ludvig Holberg, and Swedish Olof von Dalin developed a more "rational" and "pragmatic" approach to historical scholarship. By the latter half of the 18th century, while the Icelandic sagas were still used as important historical sources, the Viking Age had again come to be regarded as a barbaric and uncivilised period in the history of the Nordic countries. Scholars outside Scandinavia did not begin to extensively reassess the achievements of the Vikings until the 1890s, recognising their artistry, technological skills, and seamanship. Until recently, the history of the Viking Age had largely been based on Icelandic Sagas, the history of the Danes written by Saxo Grammaticus, the Kievan Rus's Primary Chronicle, and Cogad Gáedel re Gallaib. Today, most scholars take these texts as sources not to be understood literally and are relying more on concrete archaeological findings, numismatics, and other direct scientific disciplines and methods. The Vikings who invaded western and eastern Europe were mainly pagans from the same area as present-day Denmark, Norway, and Sweden. They also settled in the Faroe Islands, Ireland, Iceland, peripheral Scotland (Caithness, the Hebrides and the Northern Isles), Greenland, and Canada. Their North Germanic language, Old Norse, became the mother-tongue of present-day Scandinavian languages. By 801, a strong central authority appears to have been established in Jutland, and the Danes were beginning to look beyond their own territory for land, trade, and plunder. In Norway, mountainous terrain and fjords formed strong natural boundaries. Communities remained independent of each other, unlike the situation in lowland Denmark. By 800, some 30 small kingdoms existed in Norway. The sea was the easiest way of communication between the Norwegian kingdoms and the outside world. In the eighth century, Scandinavians began to build ships of war and send them on raiding expeditions which started the Viking Age. The North Sea rovers were traders, colonisers, explorers, and plunderers. Many theories are posited for the cause of the Viking invasions; the will to explore likely played a major role. At the time, England, Wales, and Ireland were vulnerable to attack, being divided into many different warring kingdoms in a state of internal disarray, while the Franks were well defended. Overpopulation, especially near the Scandes, was possibly influential (this theory regarding overpopulation is disputed). Technological advance like the use of iron, or a shortage of women due to selective female infanticide also had an impact. Tensions caused by Frankish expansion to the south of Scandinavia, and their subsequent attacks upon the Viking peoples, may have also played a role in Viking pillaging. Harald I of Norway ("Harald Fairhair") had united Norway around this time and displaced many peoples. As a result, these people sought for new bases to launch counter-raids against Harald. Vikings would plant crops after the winter and go raiding as soon as the ice melted on the sea, then return home with their loot in time to harvest the crops. Debate among scholars is ongoing as to why the Scandinavians began to expand from the eighth through 11th centuries. This model suggests that Scandinavia experienced a population boom just before the Viking Age began. The agricultural capacity of the land was not enough to keep up with the increasing population. As a result, many Scandinavians found themselves with no property and no status. To remedy this, these landless men took to piracy to obtain material wealth. The population continued to grow, and the pirates looked further and further beyond the borders of the Baltic, and eventually into all of Europe. The economic model states that the Viking Age was the result of growing urbanism and trade throughout mainland Europe. As the Islamic world grew, so did its trade routes, and the wealth which moved along them was pushed further and further north. In Western Europe, proto-urban centres such as the -wich town of Anglo-Saxon England began to boom during the prosperous era known as the "Long Eighth Century". The Scandinavians, like many other Europeans, were drawn to these wealthier "urban" centres, which soon became frequent targets of Viking raids. The connection of the Scandinavians to larger and richer trade networks lured the Vikings into Western Europe, and soon the rest of Europe and parts of the Middle East. In England, hoards of Viking silver, such as the Cuerdale Hoard and the Vale of York Hoard, offer good insight to this phenomenon. This era coincided with the Medieval Warm Period (800–1300) and stopped with the start of the Little Ice Age (about 1250–1850). The start of the Viking Age, with the sack of Lindisfarne, also coincided with Charlemagne's Saxon Wars, or Christian wars with pagans in Saxony. Historians Rudolf Simek and Bruno Dumézil theorise that the Viking attacks may have been in response to the spread of Christianity among pagan peoples. Professor Rudolf Simek believes, "it is not a coincidence if the early Viking activity occurred during the reign of Charlemagne". Because of the penetration of Christianity in Scandinavia, serious conflict divided Norway for almost a century. The first of two main components to the political model is the external "Pull" factor, which suggests that the weak political bodies of Britain and Western Europe made for an attractive target for Viking raiders. The reasons for these weaknesses vary, but generally can be simplified into decentralized polities, or religious sites. As a result, Viking raiders found it easy to sack and then retreat from these areas which were thus frequently raided. The second case is the internal "Push" factor, which coincides with a period just before the Viking Age in which Scandinavia was undergoing a mass centralization of power in the modern-day countries of Denmark, Sweden, and especially Norway. This centralization of power forced hundreds of chieftains from their lands, which were slowly being eaten up by the kings and dynasties that began to emerge. As a result, many of these chiefs sought refuge elsewhere, and began harrying the coasts of the British Isles and Western Europe. This model suggests that the Viking Age occurred as a result of technological innovations that allowed the Vikings to go on their raids in the first place. There is no doubt that piracy existed in the Baltic before the Viking Age, but developments in sailing technology and practice made it possible for early Viking raiders to attack lands farther away. Among these developments are included the use of larger sails, tacking practices, and 24-hour sailing. These models constitute much of what is known about the motivations for and the causes of the Viking Age. In all likelihood, the beginning of this age was the result of some combination of the aforementioned models. A.D. 793. This year came dreadful fore-warnings over the land of the Northumbrians, terrifying the people most woefully: these were immense sheets of light rushing through the air, and whirlwinds, and fiery dragons flying across the firmament. These tremendous tokens were soon followed by a great famine: and not long after, on the sixth day before the ides of January in the same year, the harrowing inroads of heathen men made lamentable havoc in the church of God in Holy-island (Lindisfarne), by rapine and slaughter. In 794, according to the Annals of Ulster, a serious attack was made on Lindisfarne's mother-house of Iona, which was followed in 795 by raids upon the northern coast of Ireland. From bases there, the Norsemen attacked Iona again in 802, causing great slaughter amongst the Céli Dé Brethren, and burning the abbey to the ground. 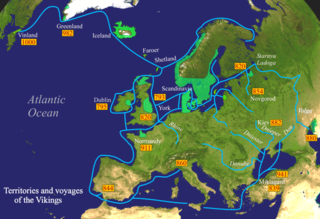 Viking expeditions (blue line): depicting the immense breadth of their voyages through most of Europe, the Mediterranean Sea, Northern Africa, Asia Minor, the Arctic, and North America. Lower Normandy, depicted as a ″Viking territory in 911″, was not part of the lands granted by the king of the Franks to Rollo in 911, but Upper Normandy. The Kingdom of the Franks under Charlemagne was particularly devastated by these raiders, who could sail up the Seine with near impunity. Near the end of Charlemagne's reign (and throughout the reigns of his sons and grandsons), a string of Norse raids began, culminating in a gradual Scandinavian conquest and settlement of the region now known as Normandy. The clinker-built longships used by the Scandinavians were uniquely suited to both deep and shallow waters. They extended the reach of Norse raiders, traders, and settlers along coastlines and along the major river valleys of north-western Europe. Rurik also expanded to the east, and in 859 became ruler either by conquest or invitation by local people of the city of Novgorod (which means "new city") on the Volkhov River. His successors moved further, founding the early East Slavic state of Kievan Rus' with the capital in Kiev. This persisted until 1240, when the Mongols invaded Russia. Other Norse people, particularly those from the area that is now modern-day Sweden and Norway, continued south to the Black Sea and then on to Constantinople. Whenever these Viking ships ran aground in shallow waters, the Vikings reportedly turned them on their sides and dragged them across the shallows into deeper waters. The eastern connections of these "Varangians" brought Byzantine silk, a cowrie shell from the Red Sea, and even coins from Samarkand, to Viking York. In 884, an army of Danish Vikings was defeated at the Battle of Norditi (also called the Battle of Hilgenried Bay) on the Germanic North Sea coast by a Frisian army under Archbishop Rimbert of Bremen-Hamburg, which precipitated the complete and permanent withdrawal of the Vikings from East Frisia. In 911, French King Charles the Simple was able to make an agreement with the Viking warleader Rollo, a chieftain of disputed Norwegian or Danish origins. Charles gave Rollo the title of duke and granted his followers and him possession of Normandy. In return, Rollo swore fealty to Charles, converted to Christianity, and undertook to defend the northern region of France against the incursions of other Viking groups. Several generations later, the Norman descendants of these Viking settlers not only identified themselves as Norman, but also carried the Norman language (a Romance language with Germanic influence), and their Norman culture, into England in 1066. With the Norman Conquest, they became the ruling aristocracy of Anglo–Saxon England. In Scandinavia, the Viking age is considered to have ended with the establishment of royal authority in the Scandinavian countries and the establishment of Christianity as the dominant religion. The date is usually put somewhere in the early 11th century in all three Scandinavian countries. The end of the Viking era in Norway is marked by the Battle of Stiklestad in 1030. Although Olafr Haraldsson's (later known as Olav the Holy) army lost the battle, Christianity spread, partly on the strength of rumours of miraculous signs after his death. Norwegians would no longer be called Vikings. In Sweden, the reign of king Olov Skötkonung (c. 995–1020) is considered to be the transition from the Viking age to the Middle Ages, because he was the first Christian king of the Swedes, and he is associated with a growing influence of the church in what is today southwestern and central Sweden. The end of the Viking Age is traditionally marked in England by the failed invasion attempted by the Norwegian king Harald III (Haraldr Harðráði), who was defeated by Saxon King Harold Godwinson in 1066 at the Battle of Stamford Bridge; in Ireland, the capture of Dublin by Strongbow and his Hiberno-Norman forces in 1171; and 1263 in Scotland by the defeat of King Hákon Hákonarson at the Battle of Largs by troops loyal to Alexander III. Godwinson was subsequently defeated within a month by another Viking descendant, William, Duke of Normandy. Scotland took its present form when it regained territory from the Norse between the 13th and the 15th centuries; the Western Isles and the Isle of Man remained under Scandinavian authority until 1266. Orkney and Shetland belonged to the king of Norway as late as 1469. Anglo-Saxon-Viking coin weight, used for trading bullion and hacksilver: Material is lead and weighs around 36 g (1.3 oz). It is embedded with an Anglo-Saxon sceat (Series K type 32a) dating to 720–750 and minted in Kent. It is edged in a dotted triangle pattern. Origin is the Danelaw region and dates to 870–930. According to the Anglo-Saxon Chronicles, Viking raiders struck England in 793 and raided Lindisfarne, the monastery that held Saint Cuthbert's relics. The raiders killed the monks and captured the valuables. The raid marks the beginning of the "Viking Age of Invasion", made possible by the Viking longship. Great but sporadic violence occurred from the last decade of the eighth century on England's northern and eastern shores; Viking raids continued on a small scale across coastal England. While the initial raiding groups were small, a great amount of planning is believed to have been involved. The Norwegians raided during the winter of 840–841, rather than the usual summer, having waited on an island off Ireland. In 850, Vikings overwintered for the first time in England, on the island of Thanet, Kent. In 854, a raiding party overwintered a second time, at the Isle of Sheppey in the Thames estuary. In 864, they reverted to Thanet for their winter encampment. The Anglo-Saxon dioceses before 925: Normal diocesan life was greatly disrupted in England during the Viking Age. The following year, the Great Heathen Army, led by brothers Ivar the Boneless (Halfdan and Ubba), and also by another Viking Guthrum, arrived in East Anglia. They proceeded to cross England into Northumbria and captured York, establishing the Viking community of Jorvik, where some settled as farmers and craftsmen. Most of the English kingdoms, being in turmoil, could not stand against the Vikings. In 867, Northumbria became the northern kingdom of the coalescing Danelaw, after its conquest by the brothers Halfdan Ragnarsson and Ivar the Boneless, who installed an Englishman, Ecgberht, as a puppet king. By 870, the "Great Summer Army" arrived in England, led by a Viking leader called Bagsecg and his five earls. Aided by the Great Heathen Army (which had already overrun much of England from its base in Jorvik), Bagsecg's forces, and Halfdan's forces (through an alliance), the combined Viking forces raided much of England until 871, when they planned an invasion of Wessex. On 8 January 871, Bagsecg was killed at the Battle of Ashdown along with his earls. As a result, many of the Vikings returned to northern England, where Jorvic had become the centre of the Viking kingdom, but Alfred of Wessex managed to keep them out of his country. Alfred and his successors continued to drive back the Viking frontier and take York. A new wave of Norwegian Vikings appeared in England in 947 when Eric Bloodaxe captured York. In 1003, the Danish King Sweyn Forkbeard started a series of raids against England. This culminated in a full-scale invasion that led to Sweyn being crowned king of England in 1013. Sweyn was also king of Denmark and parts of Norway at this time. The throne of England passed to Edmund Ironside of Wessex after Sweyn's death in 1014. Sweyn's son, Cnut the Great, won the throne of England in 1016 through conquest. When Cnut the Great died in 1035 he was a king of Denmark, England, Norway, and parts of Sweden. Harold Harefoot became king of England after Cnut's death, and Viking rule of England ceased. The Viking presence dwindled until 1066, when the invading Norsemen lost their final battle with the English at Stamford Bridge. Nineteen days later, the Normans, themselves descended from Norsemen, invaded England and defeated the weakened English army at the Battle of Hastings. In 1152, Eystein II of Norway led a plundering raid down the east coast of Britain. The Vikings pillaged monasteries on Ireland's west coast in 795, and then spread out to cover the rest of the coastline. The north and east of the island were most affected. During the first 40 years, the raids were conducted by small, mobile Viking groups. By 830, the groups consisted of large fleets of Viking ships. From 840, the Vikings began establishing permanent bases at the coasts. Dublin was the most significant settlement in the long term. The Irish became accustomed to the Viking presence. In some cases, they became allies and married each other. In 832, a Viking fleet of about 120 invaded kingdoms on Ireland's northern and eastern coasts. Some believe that the increased number of invaders coincided with Scandinavian leaders' desires to control the profitable raids on the western shores of Ireland. During the mid-830s, raids began to push deeper into Ireland, as opposed to just touching the coasts. Navigable waterways made this deeper penetration possible. After 840, the Vikings had several bases in strategic locations dispersed throughout Ireland. In 838, a small Viking fleet entered the River Liffey in eastern Ireland. The Vikings set up a base, which the Irish called a longphort. This longphort eventually became Dublin. After this interaction, the Irish experienced Viking forces for about 40 years. The Vikings also established longphorts in Cork, Limerick, Waterford, and Wexford. The Vikings could sail through on the main river and branch off into different areas of the country. Norwegian Vikings and other Scandinavians conducted extensive raids in Ireland. They founded Limerick in 812, then established Waterford in 853, founded the only Viking capital city in the world outside the Nordic countries in Dublin, and founded trading ports in Cork in the 9th century. Predominantly Norwegians, and to a smaller extent other Scandinavians, settled down and intermixed with the Irish. Literature, crafts, and decorative styles in Ireland and Britain reflected West Norse culture. Vikings traded at Irish markets in Dublin and solidified Dublin as an important city. Excavations found imported fabrics from England, Byzantium, Persia, and central Asia. Dublin became so crowded by the 11th century that houses were constructed outside the town walls. One of the last major battles involving Vikings was the Battle of Clontarf on 23 April 1014, in which Vikings fought both for the Irish over-king Brian Boru's army and for the Viking-led army opposing him. Irish and Viking literature depict the Battle of Clontarf as a gathering of this world and the supernatural, including witches, goblins, and demons. A Viking poem portrays the environment as strongly pagan, with chanting Valkyries deciding who would live and who would die. While few records are known, the Vikings are thought to have led their first raids in Scotland on the holy island of Iona in 794, the year following the raid on the other holy island of Lindisfarne, Northumbria. In 839, a large Norse fleet invaded via the River Tay and River Earn, both of which were highly navigable, and reached into the heart of the Pictish kingdom of Fortriu. They defeated Eogán mac Óengusa, king of the Picts, his brother Bran, and the king of the Scots of Dál Riata, Áed mac Boanta, along with many members of the Pictish aristocracy in battle. The sophisticated kingdom that had been built fell apart, as did the Pictish leadership, which had been stable for more than 100 years since the time of Óengus mac Fergusa (The accession of Cináed mac Ailpín as king of both Picts and Scots can be attributed to the aftermath of this event). In 870, the Britons of the Old North around the Firth of Clyde came under Viking attack as well. The fortress atop Alt Clut ("Rock of the Clyde," the Brythonic name for Dumbarton Rock, which had become the metonym for their kingdom) was besieged by the Viking kings Amlaíb and Ímar. After four months, its water supply failed, and the fortress fell. The Vikings are recorded to have transported a vast prey of British, Pictish, and English captives back to Ireland. These prisoners may have included the ruling family of Alt Clut including the king Arthgal ap Dyfnwal, who was slain the following year under uncertain circumstances. The fall of Alt Clut marked a watershed in the history of the realm. Afterwards, the capital of the restructured kingdom was relocated about 12 miles (20 km) up the River Clyde to the vicinity of Govan and Partick (within present-day Glasgow), and became known as the Kingdom of Strathclyde, which persisted as a major regional political player for another 150 years. The land that now comprises most of the Scottish Lowlands had previously been the northernmost part of the Anglo-Saxon kingdom of Northumbria, which fell apart with its Viking conquest; these lands were never regained by the Anglo-Saxons, or England. The upheaval and pressure of Viking raiding, occupation, conquest and settlement resulted in alliances among the formerly enemy peoples that comprised what would become present-day Scotland. Over the subsequent 300 years, this Viking upheaval and pressure led to the unification of the previously contending Gaelic, Pictish, British, and English kingdoms, first into the kingdom of Alba, and finally into the greater Kingdom of Scotland. The Viking Age in Scotland came to an end after another 100 years, see this section, below. The last vestiges of Norse power in the Scottish seas and islands were completely relinquished after another 200 years, see this section, below. By the mid-9th century, the Norsemen had settled in Shetland, Orkney (the Nordreys- Norðreyjar), the Hebrides and Isle of Man, (the Sudreys- Suðreyjar—this survives in the Diocese of Sodor and Man) and parts of mainland Scotland. The Norse settlers were to some extent integrating with the local Gaelic population (see Norse-Gaels) in the Hebrides and Man. These areas were ruled over by local Jarls, originally captains of ships or hersirs. The Jarl of Orkney and Shetland, however, claimed supremacy. In 875, King Harald Fairhair led a fleet from Norway to Scotland. In his attempt to unite Norway, he found that many of those opposed to his rise to power had taken refuge in the Isles. From here, they were raiding not only foreign lands but were also attacking Norway itself. He organised a fleet and was able to subdue the rebels, and in doing so brought the independent Jarls under his control, many of the rebels having fled to Iceland. He found himself ruling not only Norway, but also the Isles, Man, and parts of Scotland. In 876, the Norse-Gaels of Mann and the Hebrides rebelled against Harald. A fleet was sent against them led by Ketil Flatnose to regain control. On his success, Ketil was to rule the Sudreys as a vassal of King Harald. His grandson Thorstein the Red and Sigurd the Mighty, Jarl of Orkney invaded Scotland were able to exact tribute from nearly half the kingdom until their deaths in battle. Ketil declared himself King of the Isles. Ketil was eventually outlawed and fearing the bounty on his head fled to Iceland. The Norse-Gaelic Kings of the Isles continued to act semi independently, in 973 forming a defensive pact with the Kings of Scotland and Strathclyde. In 1095, the King of Mann and the Isles Godred Crovan was killed by Magnus Barelegs, King of Norway. Magnus and King Edgar of Scotland agreed on a treaty. The islands would be controlled by Norway, but mainland territories would go to Scotland. The King of Norway nominally continued to be king of the Isles and Man. However, in 1156, The kingdom was split into two. The Western Isles and Man continued as to be called the "Kingdom of Man and the Isles", but the Inner Hebrides came under the influence of Somerled, a Gaelic speaker, who was styled 'King of the Hebrides'. His kingdom was to develop latterly into the Lordship of the Isles. In eastern Aberdeenshire, the Danes invaded at least as far north as the area near Cruden Bay. The Jarls of Orkney continued to rule much of northern Scotland until 1196, when Harald Maddadsson agreed to pay tribute to William the Lion, King of Scots, for his territories on the mainland. The end of the Viking age proper in Scotland is generally considered to be in 1266. In 1263, King Haakon IV of Norway, in retaliation for a Scots expedition to Skye, arrived on the west coast with a fleet from Norway and Orkney. His fleet linked up with those of King Magnus of Man and King Dougal of the Hebrides. After peace talks failed, his forces met with the Scots at Largs, in Ayrshire. The battle proved indecisive, but it did ensure that the Norse were not able to mount a further attack that year. Haakon died overwintering in Orkney, and by 1266, his son Magnus the Law-mender ceded the Kingdom of Man and the Isles, with all territories on mainland Scotland to Alexander III, through the Treaty of Perth. Orkney and Shetland continued to be ruled as autonomous Jarldoms under Norway until 1468, when King Christian I pledged them as security on the dowry of his daughter, who was betrothed to James III of Scotland. Although attempts were made during the 17th and 18th centuries to redeem Shetland, without success, and Charles II ratifying the pawning in the 1669 Act for annexation of Orkney and Shetland to the Crown, explicitly exempting them from any "dissolution of His Majesty's lands", they are currently considered as being officially part of the United Kingdom. Incursions in Wales were decisively reversed at the Battle of Buttington in Powys, 893, when a combined Welsh and Mercian army under Æthelred, Lord of the Mercians, defeated a Danish band. Wales was not colonised by the Vikings as heavily as eastern England. The Vikings did, however, settle in the south around St. David's, Haverfordwest, and Gower, among other places. Place names such as Skokholm, Skomer, and Swansea remain as evidence of the Norse settlement. The Vikings, however, did not subdue the Welsh mountain kingdoms. According to Sagas, Iceland was discovered by Naddodd, a Viking from the Faroe Islands, after which it was settled by mostly Norwegians fleeing the oppressive rule of Harald Fairhair (late 9th century). While harsh, the land allowed for a pastoral farming life familiar to the Norse. According to the saga of Erik the Red, when Erik was exiled from Iceland, he sailed west and pioneered Greenland. The Viking-Age settlements in Greenland were established in the sheltered fjords of the southern and western coast. They settled in three separate areas along roughly 650 km (350 nmi; 400 mi) of the western coast. While harsh, the microclimates along some fjords allowed for a pastoral lifestyle similar to that of Iceland, until the climate changed for the worse with the Little Ice Age around 1400. The Eastern Settlement: The remains of about 450 farms have been found here. Erik the Red settled at Brattahlid on Ericsfjord. The Middle Settlement, near modern Ivigtut, consisted of about 20 farms. The Western Settlement at modern Godthåbsfjord, was established before the 12th century. It has been extensively excavated by archaeologists. Kvenland, known as Cwenland, Kænland, and similar terms in medieval sources, is an ancient name for an area in Scandinavia and Fennoscandia. A contemporary reference to Kvenland is provided in an Old English account written in the 9th century. It used the information provided by the Norwegian adventurer and traveller named Ohthere. Kvenland, in that or close to that spelling, is also known from Nordic sources, primarily Icelandic, but also one that was possibly written in the modern-day area of Norway. All the remaining Nordic sources discussing Kvenland, using that or close to that spelling, date to the 12th and 13th centuries, but some of them—in part at least—are believed to be rewrites of older texts. Other references and possible references to Kvenland by other names and/or spellings are discussed in the main article of Kvenland. The Varangians or Varyags (Russian, Ukrainian: варяги, varyagi; Belarusian: варагі, varahi; Greek: Βάραγγοι, Βαριάγοι, Varangoi) sometimes referred to as Variagians were Scandinavians, often Swedes, who migrated eastwards and southwards through what is now Russia, Belarus, and Ukraine mainly in the 9th and 10th centuries. Engaging in trade, piracy, and mercenary activities, they roamed the river systems and portages of Gardariki, reaching the Caspian Sea and Constantinople. Contemporary English publications also use the name "Viking" for early Varangians in some contexts. The term Varangian remained in usage in the Byzantine Empire until the 13th century, largely disconnected from its Scandinavian roots by then. Having settled Aldeigja (Ladoga) in the 750s, Scandinavian colonists were probably an element in the early ethnogenesis of the Rus' people, and likely played a role in the formation of the Rus' Khaganate. The Varangians (Varyags, in Old East Slavic) are first mentioned by the Primary Chronicle as having exacted tribute from the Slavic and Finnic tribes in 859. It was the time of rapid expansion of the Vikings in Northern Europe; England began to pay Danegeld in 859, and the Curonians of Grobin faced an invasion by the Swedes at about the same date. 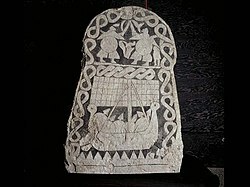 Longship on Tjängvide image stone, 800-1099. In 862, the Finnic and Slavic tribes rebelled against the Varangian Rus, driving them overseas back to Scandinavia, but soon started to conflict with each other. The disorder prompted the tribes to invite back the Varangian Rus "to come and rule them" and bring peace to the region. This was a somewhat bilateral relation with the Varagians defending the cities that they ruled. Led by Rurik and his brothers Truvor and Sineus, the invited Varangians (called Rus') settled around the town of Novgorod (Holmgard). In the 9th century, the Rus' operated the Volga trade route, which connected Northern Russia (Gardariki) with the Middle East (Serkland). As the Volga route declined by the end of the century, the Trade route from the Varangians to the Greeks rapidly overtook it in popularity. Apart from Ladoga and Novgorod, Gnezdovo and Gotland were major centres for Varangian trade. Western historians tend to agree with the Primary Chronicle that these Scandinavians founded Kievan Rus' in the 880s and gave their name to the land. Before the fall of the Soviet Union many Eastern European scholars were opposed to this theory of Germanic influence on the Rus' and have suggested alternative scenarios for this part of Eastern European history. In contrast to the intense Scandinavian influence in Normandy and the British Isles, Varangian culture did not survive to a great extent in the East. Instead, the Varangian ruling classes of the two powerful city-states of Novgorod and Kiev were thoroughly Slavicised by the end of the 10th century. Old Norse was spoken in one district of Novgorod, however, until the 13th century. Viking Age Scandinavian settlements were set up along the southern coast of the Baltic Sea, primarily for trade purposes. Their appearance coincides with the settlement and consolidation of the Slavic tribes in the respective areas. Scandinavians had contacts to the Slavs since their very immigration, these first contacts were soon followed by both the construction of Scandinavian emporia and Slavic burghs in their vicinity. The Scandinavian settlements were larger than the early Slavic ones, their craftsmen had a considerably higher productivity, and in contrast to the early Slavs, the Scandinavians were capable of seafaring. Their importance for trade with the Slavic world however was limited to the coastal regions and their hinterlands. Scandinavian settlements at the Mecklenburgian coast include Reric (Groß Strömkendorf) on the eastern coast of Wismar Bay, and Dierkow (near Rostock). Reric was set up around the year 700, but following later warfare between Obodrites and Danes, the merchants were resettled to Haithabu. Dierkow prospered from the late 8th to the early 9th century. Scandinavian settlements at the Pomeranian coast include Wolin (on the isle of Wolin), Ralswiek (on the isle of Rügen), Altes Lager Menzlin (at the lower Peene river), and Bardy-Świelubie near modern Kołobrzeg. Menzlin was set up in the mid-8th century. Wolin and Ralswiek began to prosper in the course of the 9th century. A merchants' settlement has also been suggested near Arkona, but no archeological evidence supports this theory. Menzlin and Bardy-Świelubie were vacated in the late 9th century, Ralswiek made it into the new millennium, but at the time when written chronicles reported the site in the 12th century it had lost all its importance. Wolin, thought to be identical with legendary Vineta and semilegendary Jomsborg, base of the Jomsvikings, was destroyed by the Danes in the 12th century. Scandinavian arrowheads from the 8th and 9th centuries were found between the coast and the lake chains in the Mecklenburgian and Pomeranian hinterlands, pointing at periods of warfare between the Scandinavians and Slavs. Scandinavian settlements existed along the southeastern Baltic coast in Truso and Kaup (Old Prussia), and in Grobin (Courland, Latvia). The French region of Normandy takes its name from the Viking invaders who were called Normanni, which means ‘men of the North'. Today, nordmann (pron. Norman) in the Norwegian language, denotes a Norwegian person. The first Viking raids began between 790 and 800 along the coasts of western France. They were carried out primarily in the summer, as the Vikings wintered in Scandinavia. Several coastal areas were lost to Francia during the reign of Louis the Pious (814–840). But the Vikings took advantage of the quarrels in the royal family caused after the death of Louis the Pious to settle their first colony in the south-west (Gascony) of the kingdom of Francia, which was more or less abandoned by the Frankish kings after their two defeats at Roncevaux. The incursions in 841 caused severe damage to Rouen and Jumièges. The Viking attackers sought to capture the treasures stored at monasteries, easy prey given the monks' lack of defensive capacity. In 845 an expedition up the Seine reached Paris. The presence of Carolingian deniers of ca 847, found in 1871 among a hoard at Mullaghboden, County Limerick, where coins were neither minted nor normally used in trade, probably represents booty from the raids of 843–846. After 851, Vikings began to stay in the lower Seine valley for the winter. Twice more in the 860s Vikings rowed to Paris, leaving only when they acquired sufficient loot or bribes from the Carolingian rulers. The Carolingian kings tended to have contradictory politics, which had severe consequences. In 867, Charles the Bald signed the Treaty of Compiègne, by which he agreed to yield the Cotentin Peninsula to the Breton king Salomon, on the condition that Salomon would take an oath of fidelity and fight as an ally against the Vikings. Nevertheless, in 911 the Viking leader Rollo forced Charles the Simple to sign the Treaty of Saint-Clair-sur-Epte, under which Charles gave Rouen and the area of present-day Upper Normandy to Rollo, establishing the Duchy of Normandy. In exchange, Rollo pledged vassalage to Charles in 940, agreed to be baptised, and vowed to guard the estuaries of the Seine from further Viking attacks, even though the exact opposite was often the case. The Duchy of Normandy also annexed further areas in Northern France, expanding the territory which was originally negotiated. While many buildings were pillaged, burned, or destroyed by the Viking raids, ecclesiastical sources may have been overly negative as no city was completely destroyed. On the other hand, many monasteries were pillaged and all the abbeys were destroyed. Rollo and his successors brought about rapid recoveries from the raids. The Scandinavian colonization was principally Norwegian and Danish under the leadership of Rollo. A few Swedes were present. The merging of the Scandinavian and native elements contributed to the creation of one of the most powerful feudal states of Western Europe. The naval ability of the Normans would allow them to conquer England and southern Italy, and play a key role in the Crusades. In 860, according to an account by the Norman monk Dudo of Saint-Quentin, a Viking fleet, probably under Björn Ironside and Hastein, landed at the Ligurian port of Luni and sacked the city. The Vikings then moved another 60 miles down the Tuscan coast to the mouth of the Arno, sacking Pisa and then, following the river upstream, also the hill-town of Fiesole above Florence; and others victory around the Mediterranean (including in Sicily and North Africa). Many Anglo-Danish and Varangian mercenaries fought in Southern Italy, including Harald Hardrada and William de Hauteville who conquered parts of Sicily between 1038 and 1040, and Edgar the Ætheling who participated in the Norman conquest of southern Italy. Runestones were raised in Sweden in memory of warriors who died in Langbarðaland (Land of the Lombards), the Old Norse name for southern Italy. After 842, when the Vikings set up a permanent base at the mouth of the Loire river, they could strike as far as northern Spain. They attacked Cádiz in 844. In some of their raids they were crushed either by Kingdom of Asturias or Emirate armies. These Vikings were Hispanicised in all Christian kingdoms, while they kept their ethnic identity and culture in Al-Andalus. In 1015, a Viking fleet entered the river Minho and sacked the episcopal city of Tui (Galicia); no new bishop was appointed until 1070. In 844, many dozens of drakkars appeared in the "Mar da Palha" ("the Sea of Straw", mouth of the Tagus river). After a siege, the Vikings conquered Lisbon (at the time, the city was under Muslim rule and known as Lashbuna). They left after 13 days, following a resistance led by Alah Ibn Hazm and the city's inhabitants. Another raid was attempted in 966, without success. In about 986, the Norwegian Vikings Bjarni Herjólfsson, Leif Ericson and Þórfinnr Karlsefni from Greenland reached North America, over 500 years before Christopher Columbus, and they attempted to settle the land they called Vinland. They created a small settlement on the northern peninsula of present-day Newfoundland, near L'Anse aux Meadows. Conflict with indigenous peoples and lack of support from Greenland brought the Vinland colony to an end within a few years. The archaeological remains are now a UNESCO World Heritage Site. The long-term linguistic effect of the Viking settlements in England was threefold: over a thousand Old Norse words eventually became part of Standard English; numerous places in the East and North-east of England have Danish names, and many English personal names are of Scandinavian origin. Scandinavian words that entered the English language included landing, score, beck, fellow, take, busting and steersman. The vast majority of loan words did not appear in documents until the early 12th century; these included many modern words which used sk- sounds, such as skirt, sky, and skin; other words appearing in written sources at this time included again, awkward, birth, cake, dregs, fog, freckles, gasp, law, moss, neck, ransack, root, scowl, sister, seat, sly, smile, want, weak and window from Old Norse meaning "wind-eye". Some of the words that came into use are among the most common in English, such as to go, to come, to sit, to listen, to eat, both, same, get and give. The system of personal pronouns was affected, with they, them and their replacing the earlier forms. Old Norse influenced the verb to be; the replacement of sindon by are is almost certainly Scandinavian in origin, as is the third-person-singular ending -s in the present tense of verbs. There are more than 1,500 Scandinavian place names in England, mainly in Yorkshire and Lincolnshire (within the former boundaries of the Danelaw): over 600 end in -by, the Scandinavian word for "village"—for example Grimsby, Naseby and Whitby; many others end in -thorpe ("farm"), -thwaite ("clearing"), and -toft ("homestead"). The distribution of family names showing Scandinavian influence is still, as an analysis of names ending in -son reveals, concentrated in the north and east, corresponding to areas of former Viking settlement. Early medieval records indicate that over 60% of personal names in Yorkshire and North Lincolnshire showed Scandinavian influence. The Vikings were equipped with the technologically superior longships; for purposes of conducting trade however, another type of ship, the knarr, wider and deeper in draft, were customarily used. The Vikings were competent sailors, adept in land warfare as well as at sea, and they often struck at accessible and poorly defended targets, usually with near impunity. The effectiveness of these tactics earned Vikings a formidable reputation as raiders and pirates. Chroniclers paid little attention to other aspects of medieval Scandinavian culture. This slant was accentuated by the absence of contemporary primary source documentation from within the Viking Age communities themselves. Little documentary evidence was available until later, when Christian sources began to contribute. As historians and archaeologists have developed more resources to challenge the one-sided descriptions of the chroniclers, a more balanced picture of the Norsemen has become apparent. The Vikings used their longships to travel vast distances and attain certain tactical advantages in battle. They could perform highly efficient hit-and-run attacks, in which they quickly approached a target, then left as rapidly as possible before a counter-offensive could be launched. Because of the ships' negligible draft, the Vikings could sail in shallow waters, allowing them to invade far inland along rivers. Not only were the ships light and agile, but they were light enough to be carried over land from one river system to another. "Under sail, the same boats could tackle open water and cross the unexplored wastes of the North Atlantic.". .The ships' speed was also prodigious for the time, estimated at a maximum of 14–15 knots (26–28 km/h). The use of the longships ended when technology changed, and ships began to be constructed using saws instead of axes. This led to a lesser quality of ships. While battles at sea were rare, they would occasionally occur when Viking ships attempted to board European merchant vessels in Scandinavian waters. When larger scale battles ensued, Viking crews would rope together all nearby ships and slowly proceed towards the enemy targets. While advancing, the warriors hurled spears, arrows, and other projectiles at the opponents. When the ships were sufficiently close, melee combat would ensue using axes, swords, and spears until the enemy ship could be easily boarded. The roping technique allowed Viking crews to remain strong in numbers and act as a unit, but this uniformity also created problems. 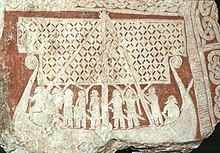 A Viking ship in the line could not retreat or pursue hostiles without breaking the formation and cutting the ropes, which weakened the overall Viking fleet and was a burdensome task to perform in the heat of battle. In general, these tactics enabled Vikings to quickly destroy the meagre opposition posted during raids. Together with an increasing centralisation of government in the Scandinavian countries, the old system of leidang—a fleet mobilisation system, where every skipen (ship community) had to deliver one ship and crew—was discontinued. Changes in shipbuilding in the rest of Europe led to the demise of the longship for military purposes. By the 11th and 12th centuries, European fighting ships were built with raised platforms fore and aft, from which archers could shoot down into the relatively low longships. The archaeological find known as the Visby lenses from the Swedish island of Gotland may be components of a telescope. It appears to date from long before the invention of the telescope in the 17th century. Recent evidence suggests that the Vikings also made use of an optical compass as a navigation aid, using the light-splitting and polarisation-filtering properties of Iceland spar to find the location of the sun when it was not directly visible. Some of the most important trading ports founded by the Norse during the period, include both existing and former cities such as Aarhus (Denmark), Ribe (Denmark), Hedeby (Germany), Vineta (Pomerania), Truso (Poland), Bjørgvin (Norway), Kaupang (Norway), Skiringssal (Norway), Birka (Sweden), Bordeaux (France), York (England), Dublin (Ireland) and Aldeigjuborg (Russia). One important centre of trade was at Hedeby. Close to the border with the Franks, it was effectively a crossroads between the cultures, until its eventual destruction by the Norwegians in an internecine dispute around 1050. York was the centre of the kingdom of Jórvík from 866, and discoveries there (e.g. a silk cap, a counterfeit of a coin from Samarkand and a cowry shell from the Red Sea or the Persian Gulf) suggest that Scandinavian trade connections in the 10th century reached beyond Byzantium. However, those items could also have been Byzantine imports, and there is no reason to assume that the Varangians travelled significantly beyond Byzantium and the Caspian Sea. ^ "History of Lindisfarne Priory". English Heritage. Archived from the original on 7 March 2016. Retrieved 3 March 2016. ^ Albert D'Haenens, Les Invasions Normandes en Belgique au IX Siecle (Louvain 1967) asserts that the phrase cannot be documented. It is asserted that the closest documented phrase is a sentence from an antiphon for churches dedicated to St. Vaast or St. Medard: Summa pia gratia nostra conservando corpora et cutodita, de gente fera Normannica nos libera, quae nostra vastat, Deus, regna, "Our supreme and holy Grace, protecting us and ours, deliver us, God, from the savage race of Northmen which lays waste our realms." Magnus Magnusson, Vikings! (New York: E.P. Dutton 1980), ISBN 0-525-22892-6, p. 61. And they came to the church of Lindisfarne, laid everything waste with grievous plundering, trampled the holy places with polluted feet, dug up the altars, and seized all the treasures of the holy church. They killed some of the brothers; some they took away with them in fetters; many they drove out, naked and loaded with insults; and some they drowned in the sea." ^ Palmer, Alan Warwick (2006). Northern Shores: a history of the Baltic Sea and its peoples. London: John Murray. p. 21. ISBN 978-0-7195-6299-0. OCLC 63398802. ^ Sawyer, Peter Hayes (1997). The Oxford Illustrated History of the Vikings. ISBN 978-0-19-820526-5. Archived from the original on 1 January 2016. Retrieved 17 October 2015. ^ "One of the most popular explanations offered for the Viking phenomenon is that overpopulation created a need for more land—especially in mountainous Norway—and thus the Vikings were largely motivated by a desire to colonise. Peter Sawyer, for example, in 1971, said that the first raids on Britain, by the Norwegians, were a byproduct of the colonisation of the Orkneys and the Shetlands, and that the Norwegians were more interested in settlement than in plunder. More recently, however, a couple of problems have emerged with this explanation. For a start, Sawyer in 1982 reneged somewhat by saying that no good evidence exists for any population pressure in the eighth century. Patrick Wormald added that what has been taken for overpopulation was just population concentration due to economic expansion and the mining of iron ore. 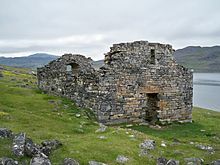 In a further point, Wormald states that no clear evidence has been found for any Viking settlement until the mid-9th century, some 50–60 years after the raids began. Thus, colonisation seems to have been a secondary feature of Viking activity; the success of the raids opened the way for settlement, but were not motivated by it, at least not initially. "The Vikings – Why They Did It, from the edited h2g2, the Unconventional Guide to Life, the Universe and Everything" Archived 18 May 2015 at the Wayback Machine (3 July 2000). See also P.H. Sawyer, "The Causes of the Viking Age" in The Vikings (R.T. Farrell, ed. 1982), London: Phillimore & Co, pp. 1–7; P.H. Sawyer, The Age of the Vikings (2nd Ed. 1971), London: Edward Arnold). "It has been suggested that the expansion of the Viking age was spurred by a population growth outstepping the capacities of domestic resources. Archaeological evidence shows that new farms were cleared in sparsely populated forest areas at the time of the foreign expansion—so the pressure of population growth is surely a contributing factor." Arne Emil Christensen Archived 4 March 2016 at the Wayback Machine, The Vikings. ^ Wicker, Nancy (1998). Hallsal, Guy, ed. Selective female infanticide as partial explanation for dearth of women in Viking Age Scandinavia. Woodbridge: Boydell press. pp. 205–21. ISBN 978-0-85115-713-9. ^ "The Anglo-Saxon Chronicle: Part 2". Medieval and Classical Literature Library. Archived from the original on 13 April 2018. Retrieved 7 June 2011. ^ The material suggesting a Norwegian origin identifies him with Hrolf the Ganger, also known as "Rolf the Walker"
^ Lund, Niels (2001). "The Danish Empire and the End of the Viking Age", pp. 167–81 in The Oxford Illustrated History of the Vikings. Ed. P.H. Sawyer. Oxford University Press. ISBN 0-19-285434-8. ^ Lawson, M.K. (2004). "Cnut: England's Viking King 1016–35". The History Press Ltd. ISBN 978-0-582-05970-2. ^ The Makers of Scotland: Picts, Romans, Gaels and Vikings, by Tim Clarkson, Birlinn Ltd, Edinburgh, 2013." ^ "Shetland Islands Council – Ports and Harbours" Archived 14 September 2010 at the Wayback Machine. shetland.gov.uk. ^ see also History of Greenland#Norse failure. ^ "Oleg". Encyclopædia Britannica. Archived from the original on 11 October 2007. Retrieved 3 August 2007. ^ "Rurik". Encyclopædia Britannica. Archived from the original on 30 September 2007. Retrieved 3 August 2007. 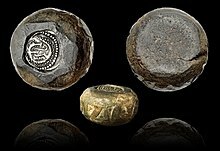 ^ A massive majority (40,000) of all Viking Age Arabian coins found in Scandinavia were found in Gotland. In Skåne, Öland and Uppland together, about 12,000 coins were found. Other Scandinavian areas have only scattered finds: 1,000 from Denmark and some 500 from Norway. Byzantine coins have been found almost exclusively in Gotland, some 400. Burenhult, Göran (1999). Arkeologi i Norden 2 [Archeology in the Nordic countries, part 2] (in Swedish). Stockholm: Natur & Kultur. ISBN 978-91-27-13478-2. Gardell, Carl Johan (1987). Gotlands historia i fickformat [The pocket history of Gotland] (in Swedish). ISBN 978-91-7810-885-5. ^ Heather, Peter. Empires and barbarians : the fall of Rome and the birth of Europe. Oxford University Press. pp. 466–467. ISBN 978-0199892266. ^ Haywood, John (8 October 2015). Northmen. Head of Zeus. ^ Carr, John (30 April 2015). Fighting Emperors of Byzantium. Pen and Sword. p. 177. ^ Hill, Paul (30 June 2015). The Norman Commanders: Masters of Warfare 911–1135. Pen and Sword. p. 18. ^ 2. Runriket – Täby Kyrka Archived 4 June 2008 at the Wayback Machine, an online article at Stockholm County Museum, retrieved July 1, 2007. ^ UNESCO World Heritage Centre. "L’Anse aux Meadows National Historic Site" Archived 16 June 2006 at the Wayback Machine. unesco.org. ^ a b c d e f Crystal, David, The Cambridge Encyclopedia of the English Language, CUP, 2001 edition, ISBN 0-521-59655-6, pp. 25–26. ^ Tignor, Robert; Adelman, Jeremy; Brown, Peter; Elman, Benjamin; Kotkin, Stephen; Prakash, Gyan; Shaw, Brent; Aron, Stephen; Liu, Xinru; Marchand, Suzanne; Pittman, Holly; Tsin, Michael. Worlds Together, Worlds Apart: A History of the World: Beginnings Through the Fifteenth Century (Fourth Edition) (Vol. 1) (Page 352). W.W. Norton & Company. Kindle Edition. ^ Foote, P. and Wilson, D.M. (1970)The Viking Achievement. Sidgwick & Jackson Ltd. ISBN 0-283-35499-2. pp. 282–85. ^ Farkas, Alexandra; Szaz, Denes; Egri, Adam; Blahó, Miklós; Barta, András; Tarczay-Nehéz, Dóra; Bernáth, Balázs; Horváth, Gábor (2014-06-30). "Accuracy of sun localization in the second step of sky-polarimetric Viking navigation for north determination: A planetarium experiment". Journal of the Optical Society of America A. 31 (7): 1645–56. doi:10.1364/JOSAA.31.001645. PMID 25121454. ^ "AFP: Viking 'sunstone' more than a myth". 1 November 2011. Archived from the original on 20 June 2013. Retrieved 15 April 2013. Forte, Angelo; Oram, Richard; Pedersen, Frederik (2005). Viking Empires. Cambridge University Press. ISBN 978-0-521-82992-2. Hall, Richard (2010). Viking Age archaeology. Shire Publications. ISBN 978-0-7478-0063-7. Harck, Ole; Lübke, Christian (2001). Zwischen Reric und Bornhöved: Die Beziehungen zwischen den Dänen und ihren slawischen Nachbarn vom 9. Bis ins 13. International Conference, Leipzig, 4–6 December 1997, Franz Steiner Verlag. ISBN 978-3-515-07671-5. Fuglesang, S.H. (1996). "Viking Art", in Turner, J. (ed. ), The Grove Dictionary of Art, Volume 32, London and New York, 1996, pp. 514–27, 531–32. Carey, Brian Todd. "Technical marvels, Viking longships sailed seas and rivers, or served as floating battlefields", Military History 19, no. 6 (2003): 70–72. Hudson, Benjamin. Viking Pirates and Christian Princes: Dynasty, Religion, and Empire in the North Atlantic. Oxford: Oxford University Press, 2005 ISBN 0-19-516237-4. ScienceNordic's article on "How Vikings navigated the world"